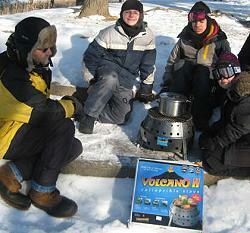 On a recent campout, the Eagles patrol tried out the Volcano II stove for their meals. They really enjoyed testing this stove while fulfilling their Second Class 'cook over an open fire' requirement. Since the temperature was 10F to 20F below zero the entire weekend, cooking on propane stoves was a real challenge. But, the Eagles had no problem getting their wood fire going and using it to cook. They boiled soup in a pot on the grill for lunch. Then, they grilled hamburgers directly on the grill for supper. The Volcano II is a collapsible fire ring that is vented to promote hot, full burning of fuel. Like the scouts, it can burn wood or briquettes, and there is a propane attachment that can be added. The Eagles found that in very, very cold temperatures it's better to let it burn out rather than dose with water. The water froze the ash solid and we needed to let it thaw before dumping it into an ash can. That was the only glitch they had, even on their first use so they were very impressed. They especially like being able to have their fire wherever they wanted, rather than right in the dirty firepit.